MANGO CURRY Fresh mango, summer squash, bell pepper, onion and baby corn. RED CURRY Mushrooms, bamboo shoots, eggplant, and bell pepper. YELLOW CURRY Pineapple, onions, summer squash, carrot and baby corn. MASAMAN CURRY Sweet potato, onions, carrot, pineapple and peanuts. EMERALD CURRY Eggplants, basil leaves, green bean and zucchini. GREEN CURRY String beans, bamboo shoots, eggplant, and green pepper. PANANG CURRY Red pepper, green pepper, green bean, and eggplant. PIK KING CURRY String bean, green pepper, red pepper and pine nuts. Stir-fried assorted vegetables and tofu in a light soy sauce. Steam vegetables served with chef’s special peanut sauce on the side. Sautéed assorted fresh vegetables in a red curry sauce. Sautéed tofu with string beans, cashew nuts, peanuts, bell peppers in a mild curry sauce. Sautéed with fresh minced hot peppers, basil leaves, mushrooms, bell peppers, and onions. 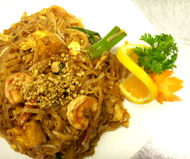 Sautéed with mushrooms, bell peppers, baby corn, and onions in a special Thai herb sauce. Pan-fried with broccoli, mushrooms, and carrots in an oyster gravy sauce. Sliced chicken sautéed with cashew nut, onions, snow pea, mushrooms, bell peppers, and scallions. Sautéed with assorted colorful vegetables in a delightful ginger sauce, topped with roasted pine nuts. Pineapple chunks, snow peas, yellow squash, and onions simmered with curry powder. Assorted vegetables and chicken in a delightful sweet and sour sauce. Sauteed tender sliced beef, stir-fried with macadamia nuts, served on bed of iceberg lettuce. Sautéed tender sliced beef with assorted vegetables in a southern chef’s style sauce. 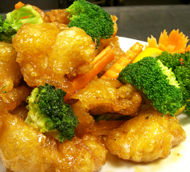 Crispy chicken with broccoli and carrots in a sweet and tangy mild orange sauce. Pan-fried in teriyaki sauce and served with steamed vegetables. Ground chicken sautéed with minced hot pepper, basil leaves, mushrooms, bell peppers, and onions. Sauteed salmon chunks with snow peas,green beans, mushrooms, bell peppers in red curry sauce. Shrimps sautéed with bell pepper, onions, mushrooms, scallions and garlic. Tender shrimp sautéed with roasted cashew nuts , onions, mushrooms, snow peas, celery and scallions. Scallops sautéed with fresh lemon juice and green vegetables in ginger sauce. Thin-sliced Japanese eggplant sautéed with scallops and basil in brown garlic soy sauce. Boneless roasted duck sautéed in Thai Choo Chee curry and vegetables. WE DO NOT USE MSG. please let us know when placing your order.